Burial of OJB Jezreel.The family of late Nigerian music producer and artiste, Babatunde Okungbowa, aka OJB Jezreel who died on Tuesday, June 14, 2016 have released details for his final burial rites. 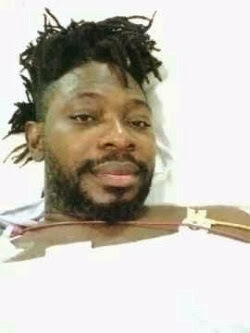 The respected music producer and singer battled with Kidney problems since 2013.
surgery, OJB Jezreel, showered praises on his first wife, Mama J, for being there for him and donating one of her kidneys to save his life and also on the people, Fans and Friends that gave supports monetarily and otherwise. However, his kidney transplant failed again a week before his demise and OJB passed on. Jigga, as he was fondly called by close friends and asosociate was prepararing for his 50th birthday slated for 4th of July before his death. His body has been deposited in Farewell Funeral Homes, Isolo. He is survived by his father, Chief Anthony Okungbowa(Arase of Agbor), Siblings, Mrs.Theresa Ebunola Gamba(USA), Mr. Cornelius Archibong(England), Mr. Albert Okungbowa(USA), Mr. Anthony Okungbowa, Marvin Okungbowa, Bose Ajila Okungbowa and Joseph Okungbowa. Wives, Mabel Babatunde Okungbowa, June Okungbowa, and Korede Okungbowa with eight children. Laying in State at his Residence: #4, Gbaja str, Surulere, Lagos. Burial at Ikoyi Cemetery, Ikoyi after service.